In Brazil, the drug tenofovir disoproxil fumarate (TDF) is widely used as part of first and second-line HIV treatment regimens. The medicine was incorporated into the country’s treatment guidelines in 2003 – but not without numerous disputes over price. Today, TDF is produced through a partnership between two Brazilian manufacturers and its price has been greatly reduced. But this was only made possible after Farmanguinhos/Fiocruz, the Brazilian government laboratory for drug manufacturing and development, and civil society groups opposed a questionable patent on the drug. The decision to oppose the TDF patent application stemmed from the high prices charged by Gilead, the originator company, which threatened the sustainability of Brazil’s universal access to free HIV treatment for its citizens. The opposition also helped raise a debate over the need to reject undeserved patent applications to protect public health. The successful pre-grant opposition is emblematic. 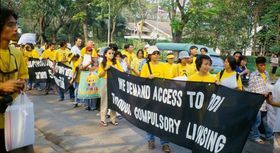 It was the first time a patent related to an antiretroviral (ARV) medicine was rejected as a result of civil society pressure. The outcome inspired confidence amongst patients and encouraged other oppositions on ARV patents in Brazil. The pharmaceutical company Gilead filed a patent application for TDF in Brazil in 1998. Though the patent was still under examination by the Brazilian Patent Office five years later in 2003, the lack of competitors in Brazil allowed Gilead to charge US$3,300 per person per year (ppy). Due to the high price of this and other ARVs, the Brazilian government started to negotiate prices with originator companies. The threat of a compulsory licence, which would allow the government to override the patent in the interest of public health and produce ARVs, as well as public laboratories with the capacity to produce them, helped to achieve some price reductions. But these reductions were not enough and, in 2006, the first generic versions of TDF produced in India became available on the international market. This placed pressure on Gilead, which ultimately agreed to halve the price of its TDF from $2,766 in 2004 to $1,380 per patient per year in 2006 in Brazil. However the growing number of patients on TDF meant that, even with this price reduction, the sustainability of Brazil's AIDS programme was under threat. In 2006, a coalition of non-governmental organisations (NGOs) known as the Working Group on Intellectual Property from the Brazilian Network for the Integration of Peoples (GTPI/REBRIP) decided to use a pre-grant opposition to prevent the patent from being granted and then to encourage competition that would reduce the price of the drug. According to Renata Reis, former coordinator of GTPI, the group had been pushing for compulsory licences since 2005, especially in the case of the ARV lopinavir/ritonavir, which at that time accounted for 30% of the budget of the Department of Sexually Transmitted Diseases, AIDS and Viral Hepatitis. “The struggle for a compulsory licence was a political fight and a dispute of concepts. It took a lot of our energy, so we realised the use of oppositions could be a strategy that would put us one step ahead, even before the granting of the patent”, says Renata. GTPI was created in 2003 to address the negative impact of the patent system on access to medicines in Brazil. It advocated for the rights of people living with HIV (PLHIV) and pushed for the use of flexibilities allowed for within the framework of international trade rules, but had no experience with patent oppositions before 2006. The group's ability to build a patent opposition relied on collaboration with other parties. In order to build the case for opposing the TDF patent, GTPI looked at the oppositions in India, as well as that of the government pharmaceutical laboratory Farmanguinhos/FIOCRUZ in 2005. The pre-grant opposition document included not only pharmaceutical arguments but also public health arguments, such as the number of people in need of the medicine and the potential impact the monopoly could have on the public health system. After presenting the opposition, GTPI publicly called on the Brazilian government to take action, because the country was paying $1,380 per patient per year, more than 10 times the best generic price offered at that time. In 2008, after GTPI had spent two years claiming the TDF patent application was undeserved and should be rejected, the government declared TDF to be of public interest. A wealth of confusion surrounded the announcement, with some media mistakenly claiming it was a move towards a compulsory licence. But this was not the case as the patent had not even been granted yet. In an unprecedented move, ABIA also filed a patent opposition in India together with the Indian NGO SAHARA (Centre for Residential Care and Rehabilitation), because a patent in India would not only restrict generic competition in India, but would also directly impact Brazil being able to import and access affordable generic versions of the drug. The Brazilian activists were aware that, should the patent be rejected, local production would take some time to start. During this delay, if no other source were available, Brazil would still have to pay monopoly prices for a short time. But finally, in August 2008, the patent office in Brazil rejected the patent application on TDF on the grounds that it lacked inventiveness. The activists and PLHIV were delighted. However, just a few months later, in March 2009, Gilead appealed the decision and also requested a divisional patent. GTPI again opposed the patents and, in another victory for access to medicines, they were successfully rejected on the basis of lack of an inventive step in May 2011. The Brazilian government has since announced the start of local production of TDF through a partnership between public and private manufacturers in Brazil. Gilead is still appealing its patent application [number PI9811045], in the Brazilian courts. Since 2003, when Brazilian civil society groups knew very little about patent oppositions, much has been achieved through collaboration and solidarity between Brazilian and Indian activists. 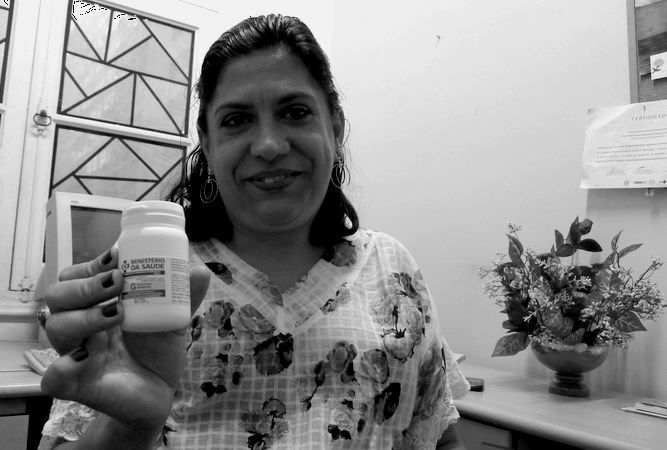 It took five years for the patent opposition to result in the first batch of locally-produced TDF for Brazilian HIV patients, but the achievements of this opposition are far-reaching and surpass the cost savings made by the Brazilian government. GTPI’s efforts to learn new strategies such as patent oppositions were made on behalf of all those people living with HIV. One such person is Mara Moreira, who coordinates an information, communication and education programme at Pela Vidda, a member organisation of GTPI which provides legal and psychological support to PLHIV. Mara was infected with HIV by her first husband, whom she married in December 1994 when she was 18 years old. Her husband died the following year. Mara started her treatment a few years after being diagnosed with HIV. Since then she has been on several treatment regimens. “My greatest wish is to have an undetectable viral load and a CD4 count of 1,200”, says Mara. She joined Pela Vidda to share her experiences with other HIV-positive people. She also took a keen interest in clinical trials on medicines and joined a number of groups to help her learn more. Mara believes there should be more focus on work to oppose patents, such as GTPI’s opposition of the HIV drug TDF, a medicine Mara has been taking for years.